Since there are very few SC's using nitrous, I frequently get asked questions about how it works and what stumbling blocks I have encountered. The learning curve has been long and expensive. But who said racing was cheap? Nitrous oxide is a chemical composed of two parts oxygen, one part nitrogen. When stored in a nitrous bottle, it is in a liquid state under pressure. When this liquid is released into the atmosphere, it instantly becomes a very cold gas. When it is injected into and engine, you are in effect supplying the motor with lots of cold air. In order to maintain the proper air to fuel ratio in the cylinders, you must add fuel to the mixture as well. You can add fuel together with the nitrous in the same nozzle (this is called a wet kit) or you can add fuel through your existing fuel injectors by increasing fuel pressure (this is called a dry kit). This large volume of cold air and fuel being injected into the motor creates more horsepower. The amount of nitrous and fuel are controlled by precise orifices in the nozzle called jets. This controls the volume of nitrous (and fuel on a wet kit) which is actually injected into motor. Different sized jets are available for different applications. Simply changing these jets allows you to change the horsepower level of your nitrous kit, and allows you to tune the air/fuel ratio if necessary. What does a nitrous kit consist of? The main components of the kit are the nitrous bottle, nitrous lines, nitrous solenoids, fogger nozzle, and associated wiring. The bottle is normally mounted in the trunk and stainless steel braided lines are run into the engine compartment. They are connected to the solenoids that operate like an electric valve to turn the nitrous flow on and off. Then the solenoids are connected to the fogger nozzle on the intake manifold where the nitrous is actually injected into the motor. If you are using a wet nitrous kit, you will also have a line running from you fuel rail to the fogger nozzle to supply fuel with the nitrous. A dry kit includes an adapter that increases fuel pressure via the fuel pressure regulator. The solenoids are wired to a switch within reach of the driver where he can turn it on and off. How do you use nitrous? Nitrous relies on the engines existing airflow to draw it through the intake manifold into the cylinders. Most cars require that you only use nitrous if the engine speed is over 3000rpm so that there is enough engine vacuum to draw in the mixture. On a supercharged application where the engine airflow is already very high at lower rpms, you can activate it sooner. You must be at full throttle whenever using the nitrous. This allows the engine computer to add more fuel and reduce engine timing. If you have a standard transmission, you will have to ensure that the nitrous is shut off when you lift the throttle to shift gears. 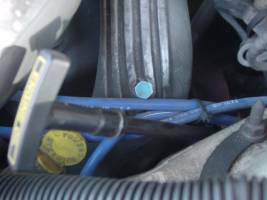 Failure to meet these conditions will likely result in an engine backfire (explosion in the intake manifold) and serious damage to the engine including the supercharger and intercooler. Another consideration is over revving your engine while using nitrous. If you happen to mis-shift your transmission, or encounter excessive wheelspin, the rpms will climb very quickly. If you don't react fast enough, you will hit the rev limiter and the engine computer will cut spark to some or all of the cylinders. This could also result in a nitrous backfire. As a general rule, you will use the nitrous as soon as traction permits off the line. Traction becomes a serious problem when you have 60-100hp at a touch of a button. A 10lb bottle of nitrous will last 6-10 quarter mile runs depending on how much horsepower shot you are using. Should I use a wet kit or dry kit? Everybody has their own opinion on this topic and there are advantages and disadvantages to both types of kits. 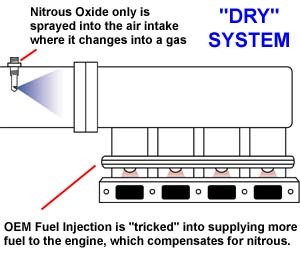 Nitrous Oxide Systems is the only company that sells dry nitrous kit since they invented and patented the technology. Dry kits are easy to install since they don't require you to run any fuel lines. All of the fuel required by the kit is supplied by raising fuel pressure through your fuel injectors to 70-80psi. There is a far less chance of backfires since you are not injecting raw fuel into the intake manifold and it can't puddle. Dry kits are limited because your fuel injectors and fuel pump can only supply so much fuel at this high pressure. Wet kits use a fogger nozzle where the nitrous and fuel are injected together. 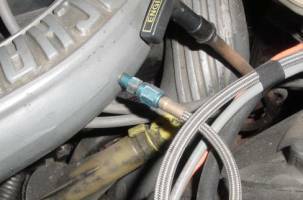 You must run a fuel line from the fuel rail's schrader valve (the port where you measure the fuel pressure) to the fogger nozzle to supply the fuel. Wet kits do not increase fuel pressure. They allow you to tune your nitrous kit more accurately because you have direct control over how much fuel is being injected by the nozzle. Wet kits are not limited by how much fuel your injectors can supply or how much fuel your fuel pump can supply at high pressure. There is a much greater chance of nitrous backfires since you are injecting raw fuel into the intake manifold. I believe a dry kit is the best choice for applications from 60-100hp. The kit is simple, safe, and reliable. If you want to exceed 100hp, then a wet kit is better since you will be able to control the fuel delivery better. You would need a heavily modified Super Coupe to withstand a nitrous shot over 100hp. I don't know of anybody reliably running that much nitrous at this time. How hard is it to install a nitrous kit? If you are comfortable performing your own maintenance on your car, you will likely be able to install it yourself. The only tricky part is mounting the fogger nozzle on the SC. It needs to be tapped into the lower intercooler tube (after the intercooler and before the intake manifold) for best results. You can also install it to the elbow from the lower intercooler tube to the intake manifold. I chose to install it in the lower intercooler tube since it was easier to drill the hole and made the nozzle more accessible for changing jets. Extra care must be taken to ensure no metal particles fall into the motor. I would not recommend injecting nitrous at the throttle body since the nitrous must travel through the supercharger and intercooler. The extremely cold temperature of the nitrous could have adverse effects on these components. This is especially dangerous if you are using a wet kit since there is a much greater chance of the fuel puddling at the supercharger or in the intercooler resulting in a backfire. It is ideal to inject the nitrous as close to the intake manifold as possible so that the motor receives a colder nitrous charge and for better nitrous/air/fuel mixture. Specific instructions for installing the other components are not specific to the SC so I won't get into them here. Detailed instructions will come with the kit. Shown below is a temporary plug where the fogger nozzle would normally be mounted in the lower intercooler tube. The other shows the fogger nozzle mounted in the upper intercooler tube. How much nitrous can I safely run on my SC? Nitrous Oxide Systems (NOS) recommends 60 hp for a stock SC using their dry kit. This is what NOS considers to be a safe and reliable level for the application. Upgrading the exhaust system will yield greater gains from your nitrous kit. Should you decide to use more than the recommended 60 horsepower shot, it will be done so at your own risk. Do I need to upgrade my ignition system to run nitrous? The Ford DIS ignition system is more than capable of sustaining over 400hp. I have not seen evidence that aftermarket ignition boxes like the MSD are beneficial for the Super Coupe. NOS recommends gapping your sparkplugs lower to .035 from the stock .054 to better ignite the mixture. I have tried changing the sparkplug gaps from .035 to .045 and did not notice any difference. I run a stock ignition system on my car with Taylor sparkplug wires and NGK Platinum sparkplugs. Do I need to upgrade my fuel system to run nitrous? A stock engine with a 60 hp nitrous kit can run the stock fuel pump. If you have other modifications, or want to run more than 60 hp nitrous, your fuel pump should be upgraded using a 190 lph or 255 lph in tank pump. You can use a BBK or Walboro pump for a 87-93 EFI 5.0L Mustang. The main advantages of using nitrous oxide are the price and performance. There is no modification that will give you more horsepower per dollar gains that nitrous will. It is relatively easy to install as well. Nitrous also generates instant horsepower when you hit the button. You have an instant horsepower gain where naturally aspirated, supercharged, or turbocharged motors must build engine rpm and boost to make more horsepower. This is especially effective for quarter mile drag racing since you get a large surge of power off the line to get the car moving. Nitrous is especially effective on the Super Coupe since it is already supercharged and intercooled. A 60hp nitrous kit will drop your ET's by about one second. A 100 hp kit on my modified motor dropped my ET's by almost two seconds. What are the disadvantages of nitrous oxide? The major disadvantage of using nitrous oxide is having to refill the bottle. Some people say that "it's not there all the time" and that is somewhat true. Other engine mods will be active all of the time. I consider nitrous to be an addition to my existing modifications, not a substitute. You must be cautious when handling nitrous. The gas is extremely cold and can cause serious injury if it comes into contact any part of your body. It should also not be inhaled as it starves your brain of oxygen and can cause unconciousness and/or brain damage. There can be some danger if the nitrous bottle pressure becomes too high. This can be caused by overheating the bottle, overfilling of the bottle, or leaving the bottle in direct sunlight on a hot day. There is a safety blowoff valve on the nitrous bottle to release the contents to atmosphere at 1500 psi. This is to prevent the bottle from actually exploding and potentially killing somebody. Some people claim that nitrous will "blow you motor" but that is only a result of improper use or installation. When a nitrous kit is installed and tuned properly, it s perfectly safe for your motor at the manufacturer's recommended horsepower level. If you decide to increase the horsepower of your kit beyond the manufacturer's recommendations, then you do so at your own risk. You have nobody to blame but yourself if your engine is damaged. What kind of problems should I be aware of when using nitrous? Upgrading the exhaust system is always a good idea when modifying an engine. The SC exhaust is already restrictive on an unmodified motor. I would strongly recommend you upgrade the exhaust system from the exhaust manifolds back. Headers would help a lot too if they are within your budget. If you intend on using more than 60hp or if you already have engine modifications, you will need to upgrade the fuel pump as well. Keep in mind that you are increasing the horsepower output of your car by up to 100 hp. If you car was only engineered to handle a certain horsepower level, then increasing the horsepower by any means, whether it be by engine modifications, supercharger, turbocharger, or nitrous oxide, you will quickly find where the limitations are. Don't blame the nitrous kit for making too much horsepower! Earlier model Super Coupes (89-93) are known to have weak head gaskets to begin with. If your car is high mileage with original head gaskets, the additional horsepower from a nitrous kit may cause them to blow. Some SC owners have claimed that simply installing a supercharger overdrive pulley caused their head gaskets to blow. Ford revised and improved the head gaskets in the 94-95 Super Coupes and should not suffer from this problem. If you are replacing your head gaskets, I would recommend using the ARP head studs available from the SCCoA. The Super Coupe uses soft liquid filled motor mounts to absorb vibration from the motor. Spirited driving in a unmodified SC is enough to break these mounts. The additional horsepower from a nitrous kit will likely accelerate the wear. You can upgrade them to solid rubber mounts found in naturally aspirated V6 Thunderbirds. You will notice slightly more engine vibration though. If you have installed a aftermarket computer chip such as Hypertech or Superchips, you will likely have to remove it before using nitrous. These chips increase engine timing which will cause detonation when using nitrous. You must be running normal engine timing when using nitrous. I am using a completely stock engine control computer and no aftermarket chip on my car. The Ford Double Platinum sparkplugs are not suitable for high horsepower nitrous applications. The platinum disks attached to the electrodes will blow off under extreme cylinder pressure (the electrodes themselves don't blow off). This substantially increases the spark plug gap and will cause misfiring. This may not occur at the 60 hp level, but will definitely occur at the 100 hp level. I would recommend regular Ford plugs or NGK Platinum sparkplugs for this application. I don't like the Bosch Platinum plugs since the electrode is extremely small and tends to burn back into the ceramic insulator. Which nitrous kit should I buy for my SC? Most nitrous kits contain the same parts. Some lines, brackets, or wiring may be different to fit specific applications. 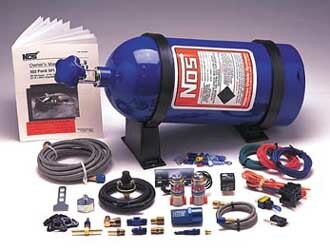 I would recommend using a nitrous kit for a 87-93 EFI 5.0L Mustang. NOS offers a Stage 1 kit (up to 100hp) and a Stage 2 kit (up to 150hp) kit for this application. The Stage 2 kit includes different jets, and a Bosch in-line high pressure fuel pump. For our application, only the Stage 1 kit is necessary. The Mustang kits are the most common, and are cheaper than other kits. The brand name you choose will depend on personal preference and price. Some brands to consider are NOS, Compucar, Nitrous Express, and ZEX. Note that NOS brand jets are the most common, cheap, and easy to find. Compucar jets are harder to find, and are much more expensive. What optional accessories should I consider for my nitrous kit? There are many accessories that contribute to the safety and convenience of using nitrous. The first is the wide-open-throttle switch. This is standard with all kits but many choose not to install it. This switch only allows the nitrous to be activated when you are full throttle. Activating the nitrous system at idle or part throttle will likely result in a backfire and serious engine damage. This is a must! Next is an rpm activated window switch. This module will only allow the nitrous to be activated above and below two preset rpm points. For example, from 3000 to 6000rpm. Above or below this window, the nitrous kit will automatically shut off to prevent engine damage. A nitrous bottle pressure gauge will let you monitor and maintain the proper pressure of your nitrous bottle. If the pressure it too high, the car will run lean. If the pressure is too low, it will run rich. Nitrous kits are designed to run with the bottle pressure between 950 and 1050 psi. A bottle heater is critical if you want to use nitrous on cool days or cold nights. The bottle pressure must be 950-1050 psi. The pressure will drop below this if the weather is too cold. The bottle heater will maintain the temperature for optimum performance. NOS makes a bottle heater which is thermostatically controlled - just turn it on and forget about it. Other heaters have no automatic control and must be manually shut off when the desired pressure is reached. A bottle blanket is an insulated cover for your bottle that helps hold the heat in and requires the bottle heater to cycle on less often. It looks nice, it's cheap, and functional. A remote bottle valve is a nice luxury to have. Normally you would have to turn the bottle valve on each time before using the nitrous, then turn it off afterwards. This valve allows you to keep the bottle open in the trunk at all times and have it ready for use at a flick of a switch. This also gives you a secondary method of stopping nitrous flow to the motor should a nitrous solenoid fail. A second nitrous bottle (or a larger 15lb bottle) is a must for serious racers. This way you are never caught empty handed. There are times when you just can't get the bottle refilled when you need it. A fuel pressure gauge and exhaust gas temperature gauge will help you tune you nitrous kit for maximum results. This will let you know if your fuel supply cannot keep up and if you motor is running rich or lean. If you only intend on running a 60 hp kit, these are really not necessary. Nitrous Oxide can be a safe and cost effective method of increasing horsepower in the Super Coupe. Nitrous oxide should be considered as a modification for racing purposes only. It's only purpose is to get you to the end of the quarter mile before the other guy. There are certain safety and reliability issues associated with racing any car and the Super Coupe is no exception. If you are going to increase the horsepower output and race on a regular basis, you will break parts. This is a risk you accept when you become an active drag racer. Nitrous is not for everybody. Some prefer to perform smaller modifications which they can feel all of the time. Others want an all out rush of power for drag racing. That is something you have to decide for yourself. If your budget is big enough, you can have both. I can tell you from experience that the feeling of a 100 hp surge at the touch of a button is addictive. Once you've tried it, you won't want to give it up. You can find plenty of useful information about general nitrous oxide applications from NOS's website at www.nosnitrous.com.